Coming out of the 1980’s Norwegian post-punk scene When is the solo-project of Lars Pedersen. When is like his own musical amusement park, every album differing a lot from the previous – Pedersen obviously likes to challenge himself and push for something new every time. The first albums were in a similar landscape as what he was doing with industrial art-rock band Holy Toy, and his later works have veered into everything from cartoon cut-up, psychedelic pop, prog. 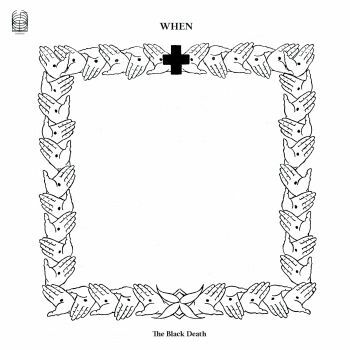 and even krautrock territories, but in between all this we find his fourth album from 1992 – The Black Death (and simultaneously titled as Svartedauen in Norwegian) – a decidedly darker creation. The album is a sound-journey of the great plague entering and ravishing Norway in 1349, killing two-thirds of the Norwegian population within a few years, reducing an already small population to a bare minimum of survivors. The album was inspired by a series of grim drawings on the subject by Theodor Kittelsen.Kittelsen is one of Norway’s most renowned artists, with Svartedauen being his seminal work from the year 1900, a national treasure as instantly recognizable to most Norwegians as Munch’s The Scream. Pedersen had the balls to make a soundtrack to it. Svartedauen is a 38 minute musique concrète sound-collage. In a highly sophisticated manner it mixes elements of manipulated traditional Norwegian folk music (such as the eerie sounding Harding fiddle), with sounds of horses whining, rats gnawing, wood grinding and people moaning. Musically it fits somewhere between Nurse With Wound’s dadaist studio experiments and Luc Ferrari's dramatic narrative environmental sound poems. But because Svartedauen tackles such a dark subject it is unlike any other musique concrète compositions I know. Pedersen masterly makes us feel the desperation of rural plague-ridden Norway – a sonic maelstrom slowly moving forward towards the inevitable apocalypse. A scary and uncomfortable, yet fascinating listen. Fans of Norwegian black metal will recognize the Kittelsen art as the same that adorns several Burzum album covers. A little known fact is that Varg Vikernes, and most other black metal musicians during their church-burning heydays, were big fans of this particular When album. The Black Death’s release just happened to coincide with the black metal summer of 1992 and was thus embraced by a generation of young metal artists about to radically change the musical landscape of extreme metal forever. Listening to the album with that in mind it actually makes a lot of sense – Svartedauen incomparably evokes that feeling of doom and medieval dread that the black metal bands were attempting with croaked screams and distorted guitars around the same time. So if you're looking for the missing link between Arne Nordheim and Mayhem – this is it. And finally the plague will be unleashed on the vinyl format. Pristine vinyl cut by Rashad Becker at Dubplates & Mastering and packaged in a gatefold sleeve featuring texts and interviews with and about Pedersen as well as a 12 page booklet of Kittelsen's drawings for Svartedauen. The rats would be pleased. Ideologic Organ curation and art direction by Stephen O’Malley, manufactured and distributed by Editions Mego.